In order to form an opinion on the effects of the euro, we could start out from a simple question: what sort of impact had the introduction of the euro on a specific product, let us say a tomato, that a country (e.g. the Netherlands) cultivates and exports? The Netherlands has a strong horticultural sector. At first sight, it seems as if the Dutch exports in horticultural products have benefitted greatly from the euro. In 2010, almost 10% of the workforce worked in the production, knowledge development and trade of vegetables and fruits. 75% of the exports of tomatoes, cucumbers, paprika, etc. were within the EU. Exports within the EU have benefitted from European integration since 1992 with the removal of trade barriers, the definition of common food laws, the protection of patent rights and the introduction of the euro. Since the introduction of the euro in 2002 the exports of vegetables and of fruits have increased massively with 90% and more depending on products and regions. Exports to southern European Member States have proven to be particularly impressive with a growth of 241% between the introduction of the euro and 2010. Does this mean that the euro was a big success? There are many reasons for this sharp increase in exports from the Netherlands and for the increasing imports by the southern Member States. One explanation for the favourable exports between 2002 and 2010 was the introduction of the euro. Tomatoes and related products are bulk products with low margins. Hence, the export success depends on enormous volumes combined with low profits margins. As a result, small changes in costs result in major changes in trade. The introduction of the euro contributed in two ways to the export success. The euro implied lower transaction costs, and lower costs with bulk products imply more exports. In addition, the economic conditions in the southern countries was inflated due to investments in housing, the inflow of cheap capital and high consumption. 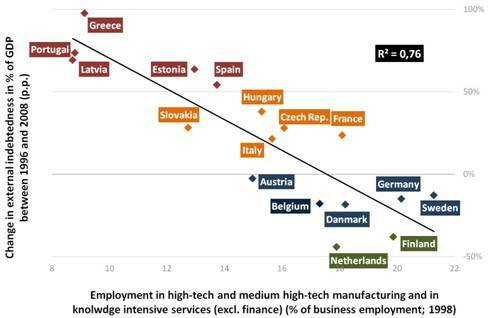 There were few incentives within the eurozone to lower wages and prices. As a result, Dutch horticultural exports to southern Member States flourished and investments in production went up, meaning that the success of the Dutch production and exports was partly a sign of failing market adjustments in the south. Evidently, this upswing in Dutch exports has had its flip sides. Production in the south was pushed back before 2010. At the same time, investments in the Netherlands had gone up leading to the current overcapacities. These days, Dutch export of tomatoes within the EU is dropping. At first sight, this might appear to be a logical consequence of the general economic crisis given that consumption is falling in many eurozone countries. What is much less realised is that it is also the introduction of the euro that can partly be blamed for the present economic setback in horticulture. Currently we see wages in southern eurozone countries dropping, production and export of horticultural articles from the south are increasing, and, as a result, imports from the Netherlands drop and exports to the northern countries increase. Dutch export is not only dropping towards southern countries but also towards countries like the UK due to stronger competition from southern tomatoes. Looking back, it would have been better had the market for horticultural products remained more in balance. The success of the exports was in part the result of failing markets within the eurozone. Would markets have adapted more smoothly, exports from the Netherlands would not have grown so fast and this would have prevented overinvestments and less adjustments once the crisis set in. Similarly, production in the south would have increased earlier had markets been more flexible. This shows that the introduction of the euro – a macroeconomic development – resulted in microeconomic imbalances in the market for horticultural products. Looking back, the increase in Dutch exports following 2002 was too high and is now followed by a reversal of trade flows. The story of the tomato tells us that the increase in exports due to the euro was also a sign of insufficient adaptations in the south and has resulted in a hard landing that could have been prevented had the euro not functioned as a ‘sleeping pill’ to postpone market adaptations. At the same time, export surpluses were not matched by adaptations in exchange rates so that adaptions in the end have been more abrupt. What goes up must come down. Paradoxically, the euro has aggravated the ups and the downs. Like it or not, the well-functioning of markets is even more important with the euro. There are signs that the economies in the eurozone are picking up in various ways. Recent figures of the ECB on Target2 (the capital account of the eurozone countries within the ECB) show remarkable signs of improvement. The claims of the triple-A countries Germany, Finland and the Netherlands on the problem countries are going down. The Dutch and the German claims at the peak of Target2 lending in 2012 amounted to € 173 billion and € 750 billion, but these have dropped by almost 20% since. There are many explanations for this development. Draghi’s promise to do ”whatever it takes” to keep the eurozone intact, has created the trust needed to restart trade in sovereign debt of Spain, Ireland, Portugal and Italy. In addition, (wage) reforms and austerity measures have reduced the imports; investors are returning and exports of for example horticultural products are increasing. These developments in the south imply enormous reductions in risks for the budgets of northern countries. If the situation in the problem countries had deteriorated, the Target2 claims could have end up as losses – and downgrades – for the triple-A countries. These claims are not just important in terms of abstract risks on the ECB books, but they also have practical implications for the national debt positions. The Dutch government used the profits from the Central Bank on the sovereign debts from Southern countries to lower its public debt figures, so that the deficit is at least cosmetically closer to the 3% monitored by Olli Rehn. However, including the Target2 risks of the ECB in the national budgets would show that national debts are potentially much higher. Also in this respect the drop in the ECB’s Target2 exposure is good news. However, the difficulties in the eurozone and the Target2 risks are far from over. The Global Competitiveness report for 2012-2013 displays the many remaining economic hurdles in the eurozone including repeated warnings over inflexible labour markets in Spain. Moreover, the outcome of the recent elections in Italy obviously creates additional challenges. The real worry however is France. Its Target2 deficit has not gone up due to the deterioration of its current account. Moreover, its public debt is rising above 95% – which means that its debt becomes unsustainable. The global competitiveness index of France has fallen last year from 18 to 22. It is doubtful whether the French social economic institutions – including its labour relations – are up to the economic challenges France is facing. Despite the efforts of Olli Rehn with the reinforced EU semester, France has shown few signs of improvement over the past year. Worryingly, with the economic reforms in its neighbouring countries including Spain and the Netherlands, its competitiveness and current account balance is being threatened from all sides. We saw in August 2011 that financial markets woke up to the worries over Italy’s economic situation. Typically, this awakening did not happen with a whisper but with a bang. The crisis in the eurozone was then probably at its worst because of the size of the Italian economy. An immediate crisis over France may not be around the corner, but all ingredients for the next major euro problem are present. Symbolically as well as economically, a eurocrisis over France would be extremely damaging to the European integration project as a whole. It is surprising that the French interest rates are currently still comparable to those of Germany. Either financial markets are irrational or they are counting on Draghi’s unconditional support for France. Both explanations would be very dangerous economically and politically. Irrational financial markets could prove to be extremely volatile and a repetition of August 2012 is possible. Alternatively, German – and Dutch – patience with Draghi and the ECB could reach its limits. FDP chairman Brüderle already warned France that reforms are needed. The EU cannot afford an existential crisis because of French economic negligence. A long book is probably too short to explain the European crisis in full length and depth. However, the essential causes of this crisis can be grasped with two simple ideas. Since 2010, the interest rates on the sovereign bonds of some EU countries has increased sharply. According to the official view, the causes of this sovereign debt crisis are to be found in unsustainable national fiscal policies and the postponement of ‘structural reforms’– mainly labour market liberalisation and pension systems’ reforms – in the countries most affected by the crisis. But this is not what the data show. Fiscal developments and changes in labour market laws and pension systems vary widely across countries, both among those most affected by the crisis and among the remaining EU member states. 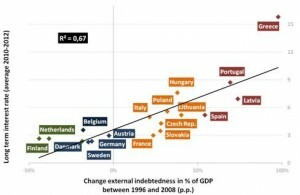 On the contrary, as the first graph shows, the relation between the sovereign debt crisis and external indebtedness (public and private) is rather clear: countries whose sovereign debt interest grew the most in 2010-2012 were those which accumulated more external debt since the mid-1990s (Figure 1). Notes: External indebtedness is measured by the International Investment Position, a commonly used indicator of external debt. Data on some EU countries is unavailable for the period under analysis, namely: Bulgaria, Cyprus, Estonia, Slovenia, Ireland, Malta and Romania. Therefore, in order to understand the causes of the European crisis first we have to explain why some countries accumulated more external debt (public and private) than others over the years. This brings us to the second idea. In the 20 years preceding the global crisis of 2008/9, EU economies have undergone significant transformations, most of which were politically induced. These include: the abolition of customs barriers within the EU, the creation of the internal capital market, the liberalization of financial flows and activities, the increasing EU level control over monetary and fiscal policies, the trade agreements between the EU and China (and other emerging economies), the Eastern EU enlargement, the appreciation of the euro against the dollar (from 2003), or the sharp increase in oil prices (between 2002 and 2008). These changes encompassed all Member States, but had very different impacts across countries. Lacking the appropriate policy instruments to manage such impacts, countries with less advanced productive structures accumulated more debt (public and private) than the others. This is shown in Figure 2. In other words, the rules and institutions of the EU have proved very suitable for certain economies with more advanced productive structures, but detrimental for others. It is worth noting that productive structures take a long time to change, regardless of the policies pursued at the national level. It makes little sense to sustain that the sovereign debt crisis is fundamentally caused by government misconduct in specific countries. To be sure, citizens from different parts of Europe have many reasons to complaint about the quality of their democracies and the about decisions taken both at the national and the EU levels. Still, the main mistake of the national leaders of those countries most affected by the crisis was probably the decision to participate in the European integration process according to the rules that were adopted in the past decades, without anticipating the difficulties this would create for their economies. Their greatest mistake will be to persist in the same path.